Our ceremonies are about life and healing, from the time this ancient ceremonial rite was given to our people, never has death been a part of our inikag’a (life within) when conducted properly. 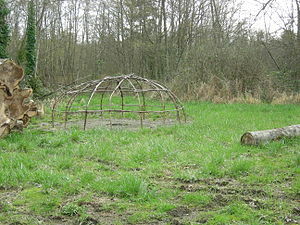 Today the rite is interpreted as a sweat lodge, it is much more then that. So the term does not fit our real meaning of purification. 19 generations ago, the Lakota/Dakota/Nakota Oyate (people), were given seven sacred rites of healing by a Spirit Woman ­ Pte San Win (White Buffalo Calf Woman). She brought these rites along with our sacred C’anupa (pipe) to our People, when our ancestors were suffering from a difficult time. It was also brought for the future to help us for much more difficult times to come. They were brought to help us stay connected to who we are as a traditional cultural People. The values of conduct are very strict in any of these ceremonies, because we work with spirit. The way the Creator, Wakan Tanka told us; that if we stay humble and sincere, we will keep that connection with the inyan oyate (the stone people), who we call the Grandfathers, to be able to heal our selves and loved ones. We have a gift of prayer and healing and have to stay humble with our Unc’i Maka (Grandmother Earth) and with one another. The inikag¹a is used in all of the seven sacred rites to prepare and finish the ceremonies, along with the sacred eagle feather. The feather represents the sacred knowledge of our ancestors. – by going on the vision quest for four years and four years Sundance. Then you are put through a ceremony to be painted – to recognize that you have now earned that right to take care of someone¹s life through purification. They should also be able to understand our sacred language, to be able to understand the messages from the Grandfathers, because they are ancient, they are our spirit ancestors. They walk and teach the values of our culture; in being humble, wise, caring and compassionate. When you do ceremony – you can not have money on your mind. We deal with the pure sincere energy to create healing that comes from everyone in that circle of ceremony. The heart and mind must be connected. When you involve money, it changes the energy of healing. The person wants to get what they paid for; the Spirit Grandfathers will not be there, our way of life is now being exploited! You do more damage then good. No mention of monetary energy should exist in healing, not even with a can of love donations. When that energy exists, they will not even come. Only Œafter¹ the ceremony, between the person that is being healed and the Intercessor who has helped connect with the Great Spirit, the energy of money can be given out of appreciation. That exchange of energy is from the heart; it is private and does not involve the Grandfathers! Whatever gift of appreciation the person who received the help, can now give the Intercessor what ever they feel their healing is worth. In our Prophesy of the White Buffalo Calf Woman, she told us that she would return and stand upon the earth when we are having a hard time. In 1994 this began to happen with the birth of the white buffalo, not only their nation, but many animal nations began to show their sacred color, which is white. She predicted that at this time there would be many changes upon Grandmother Earth. There would be things that we never experienced or heard of before; climate changes, earth changes, diseases, disrespect for life and one another would be shocking and there would be also many false prophets! Because of the problems that began to arise with our rebirth of being able to do our ceremonies in the open since the Freedom of Religion Act of 1978, our Elders began talking to me about the abuses they seen in our ceremonial way of life, which was once very strict. After many years of witnessing their warnings, we held a meeting to address this very issue of lack of protocol in our ceremonies. After reaching an agreement of addressing the misconduct of our ceremonies and reminding of the proper protocols, a statement was made in March 2003. Every effort was made to insure our way of life of who we are as traditional cultural People was made, because these ways are for our future and all life upon the Grandmother Earth (Mitakuye Oyasin ­ All my relations), so that they may have good health. Because these atrocities are being mocked and practiced all over the world, there was even a film we made called Spirits for Sale. The non-native people have a right to seek help from our First Nation Intercessors for good health and well-being, it is up to that Intercessor. That is a privilege for all People that we gift for being able to have good health and understand that their protocol is to have respect and appreciate what we have to share. The First Nations Intercessor has to earn that right to our ceremonial way of life in the ways I have explained.